From your project page, go to Construction > View on Site Diary tile. From your projects dashboard, click Reports button. 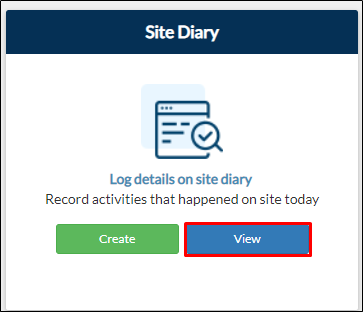 Locate the Site Diary Report then click View Report. This can be found under All or Construction tab. 2. You will be redirected to Site Diary Report page where you can view all the submissions. Click Update to apply changes to your submission. 3. You will be directed to the form where you can view your current data. Update the fields you want to modify. 4. Click Save. Your updated submission will be displayed on the table as another record.